Home › Health & Wellness › Decisions, Decisions: Chair massage or table massage? Should I have a seated back massage or a full body table massage??? And, what is the difference? One of the beauties of massage is that it all feels good and is a stress busting investment in your health. A seated back massage is performed in a specially designed chair where the client sits face-forward. 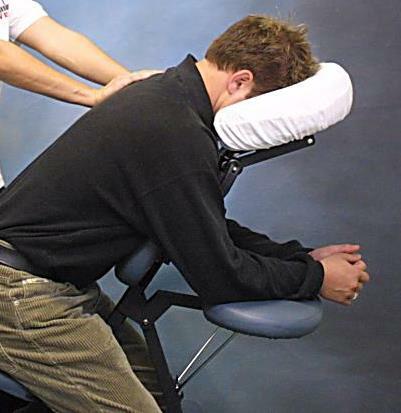 The therapist performs a series of soft tissue techniques that include sports massage, acupressure, and stretches which loosen tight muscles and open joints in the neck, shoulders, and low back. The advantages of a seated back massage are: it targets the areas where most people carry their tension, it is performed through the clothing without oil or lotion, and there is little preparation time. Seated back massages are performed in 15 or 30 minute sessions. The 30 minute session allows more time to concentrate on problem areas. A full body table massage is performed in a private room. The client is undressed and covered by a flannel sheet. The therapist uncovers only the area where they will be working, so that the client is never more exposed than they would be wearing a swimsuit. A full body massage is performed using lotion or oil. Each therapist has their own sequence of techniques which vary from Swedish massage to deep tissue massage depending on the need of the client. The biggest advantage of a full body massage is that it addresses all the tension areas that result from injury, over use, and compensation caused by our bodies protecting injured areas. Full body massages are performed in 60, 90 or 120 minute sessions depending on the needs of the client. Seated chair massage and full body table massage both are available at Dave’s Massage Works .